We’ve All Won 2016 Hermes Gold Design Awards! Hermes Creative Awards is a highly-regarded, international design competition. In the design world, it’s almost like winning a grammy! 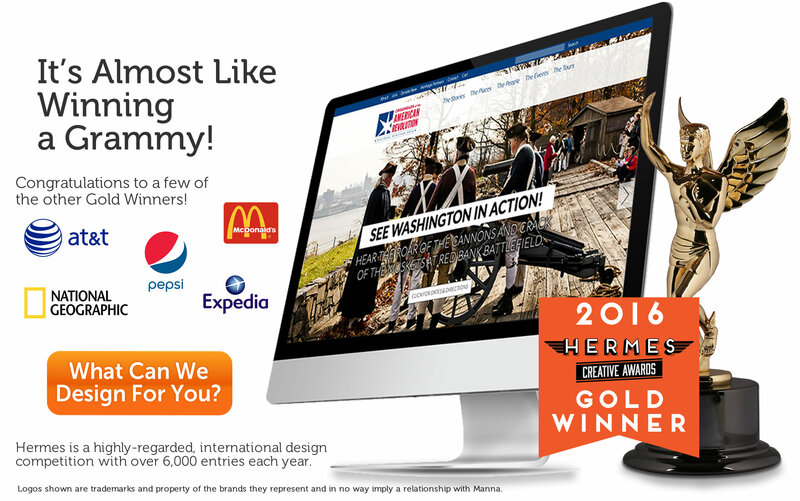 Manna Design is proud to be named on the Gold Award winners list for their designs on the nonprofit website, Crossroads of the American Revolution. A few other 2016 Gold Award winners include AT&T, McDonald’s, Pepsi, Expedia and National Geographic. The Association of Marketing and Communication Professionals administers the recognitions. AMCP sets the standards of excellence and conducts all judging for the creative awards. With over 6,000 entries per year, the Hermes Creative Awards has become one of the largest competitions for designers in the world. Corporate marketing and communication departments, advertising agencies, PR firms, graphic designers and web creators all submit their best work in hopes of winning this prestigious award. The competition is extremely talented and Manna Design is honored to have been recognized. Crossroads of the American Revolution National Heritage Area connects people to New Jersey’s rich Revolutionary history. Based in Trenton, NJ they were established by Congress in 2006 by its federally approved management plan. National Heritage Area aims to celebrate history through educating the public. 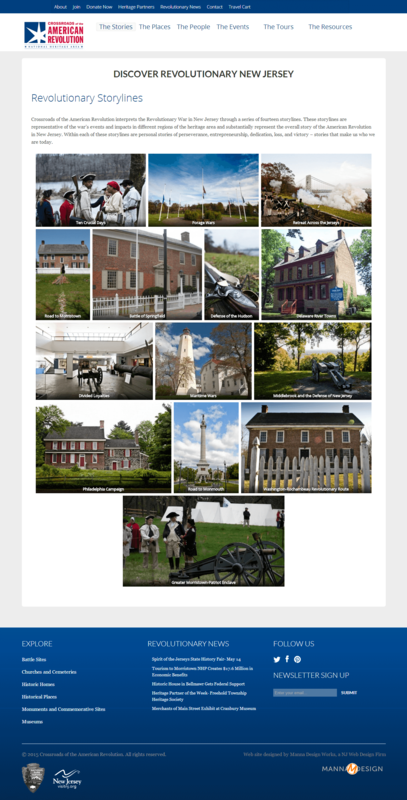 Encompassing approximately 2,155 square miles of New Jersey, the nonprofit works with historic sites, preservation groups, historical societies, friends organizations, state, county and local governments, schools, libraries and museums. Crossroads of the American Revolution is custom designed WordPress website. The web design is mobile friendly, making it easy to view on all devices. RevolutionaryNJ.com uses SEO (Search Engine Optimization) to increase visibility on search engines, bringing more traffic to the site. Their WordPress web design is a full CMS, which stands for content management system. This allows Crossroads of the American Revolution to maintain their own site, giving them access to update content and materials without relying on a web developer. Guests visiting the website have the ability to register for newsletters and exclusive memberships. Donations and online payments are made possible using eCommerce.